By displacing the front magnet carrier and other components so that no objects or voids are in line with the cantilever assembly, a truly direct path is established between the cantilever assembly and headshell. Control over spurious resonances is further assisted by the use of a narrowed mounting area, which couples Etna more tightly to the headshell and facilitates the transfer of vibrational energy into the tonearm. Vibrations are quickly drained away once converted to electrical signals, effectively suppressing induced resonances and internal reflections that would otherwise manifest themselves as sonic colorations and overhang. 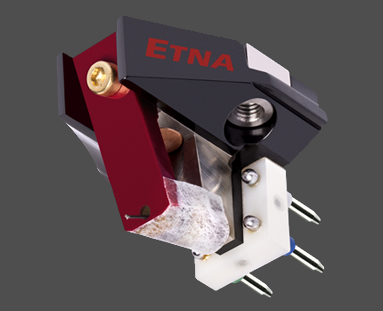 Etna uses a yokeless dual magnet system, diamond-coated boron rod cantilever and Lyra-designed variable-radius line-contact stylus (major radius 70 micrometers, minor radius 3 micrometers, block dimensions 0.08 x 0.12 x 0.5mm, mounted within a slot machined into the front of the cantilever), and builds the cantilever assembly directly into the titanium body structure. Both the cantilever and the insides of the titanium body core are shaped so that joining the two components to each other creates a double-knife-edge mounting system, which focuses as much pressure as possible on the joint area and achieves a type of cold weld. More rigid than the cantilever mounting system employed in the Titan, this design facilitates the transfer of mechanical energy away from the stylus and signal coil area and minimizes reflected mechanical energy, thereby significantly reducing distortion and resonances. Another design strength is Etna's high-efficiency X-shaped signal coils, which it shares with the flagship Atlas. Compared to traditional square coil formers the X-shape allows each channel to operate with greater independence from one another, giving better tracking, tighter channel matching, improved separation, and lower crosstalk-induced distortion. Although there are and have been other X-coil cartridges; their benefits have been accompanied by poor efficiency (in converting mechanical work into electrical output), either requiring high internal impedance (the larger coils add considerable moving mass and increase noise), and/or having low output voltage (which stresses the phono stage). To overcome this weakness, Lyra conducted a careful investigation of X-core coils, using a combination of mathematical analysis and hands-on experimentation. The outcome of the analysis program was a very specific X-core shape that not only had higher efficiency than any previous X-core cartridge, but also surpassed the efficiency of our earlier square-coil cartridge designs. Rather than using all of the extra efficiency to single-mindedly increase the output voltage, we chose to allocate part of the extra efficiency to increase the output voltage (12% higher than Titan i), and use the remainder of the extra efficiency to reduce the amount of wire in the coils (22% less than Titan i). The lowered mass further improves tracking performance, while the higher output and lower internal impedance allow phono stages to perform better. Etna uses Lyra's "New Angle" technology, which mechanically pre-biases the signal coils so that the vertical tracking force brings them into perfect alignment with the front and rear magnets when LP playback takes place. This system also equalizes out discrepancies in vertical and horizontal compliances, and enables Etna's coils to move with equal ease in all directions for wider dynamics, higher resolution, and improved tracking. In every possible way, we have done our utmost to enable Etna to reach the very highest levels of performance. While Etna is second from the top in Lyra's line, one listen will demonstrate that its performance would define the very top of any other cartridge line.